Vehicles passing through a pall of dust along the main road in Biratanagar this week. BIRATNAGAR, Jan 6: On Wednesday, Dinesh Rajbanshi of Birtnagar-6 had to travel back and forth from his home and bordering Indian town of Jogabani twice. Although he wore a facemask and had his whole body covered from top to bottom, he still could not avoid excessive dust while travelling on his motorbike. Upon reaching home, he dusted off his clothes. He developed respiratory problems after inhaling dust throughout the day. He visited a local hospital for a checkup. Not just him, local children and adults who regularly have to travel to schools, colleges, offices and markets are suffering from similar problems. Every nook and corner of the streets is filled with dust throughout the day. Locals complained that various places dug for construction of sewer and six-lane road without giving consideration to health of the general public have led to this dire situation. Especially the six-kilometer road section from Rani to Bargachhi along the Koshi Highway is covered in clouds of dust throughout the day. This is one of the busiest streets of Biratnagar. Dust raised by the ongoing construction of the six-lane road has been causing severe impact on the health of the general public, the locals complained. Contractor of the road-widening work – Kalika Constructions, is supposed to finish the sewer construction by March. It has dug pits at various places along the roads. Lack of proper management and haphazard digging of roads have caused severe air pollution in the city. 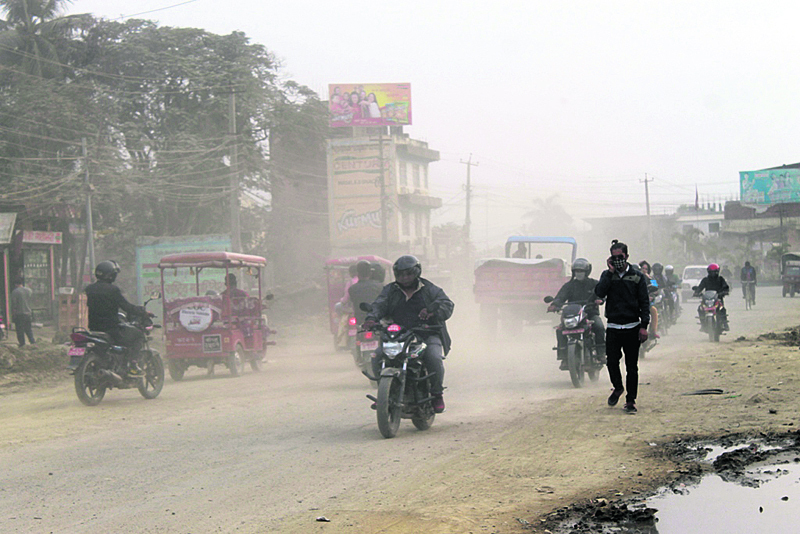 The locals complained that the Biratnagar Sub-metropolitan City and the Road Division Office have been ignoring the dust problem. “Although we have requested the concerned government offices to address the problem, they have remained mum on the issue,” said Chapagain, expressing utter disgust.